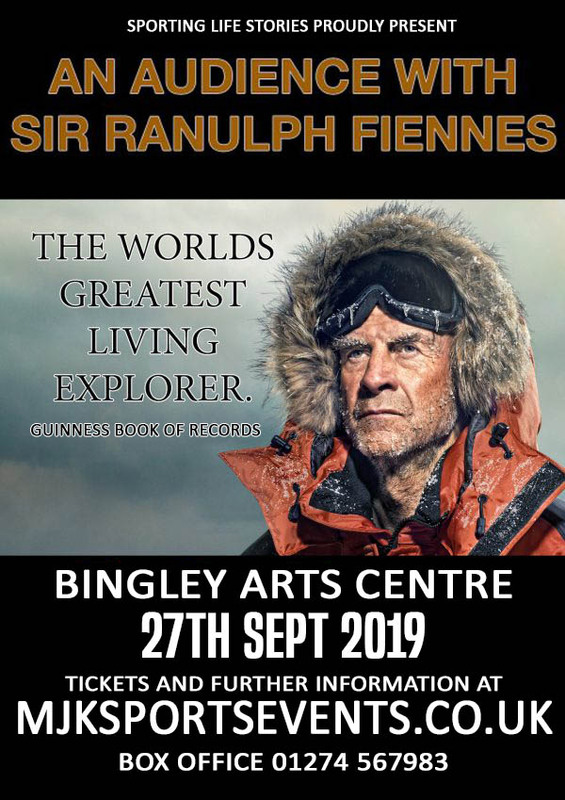 SIR RANULPH FIENNES, THE WORLDS GREATEST LIVING EXPLORER. Listening to Sir Ranulph Fiennes’ incredible stories leaves you dumbfounded and in a state of disbelief. From his self-deprecating tales of academic failure, through his time in the Forces, to discovering lost Middle Eastern cities and of course, his many and varied expeditions, it’s amazing how much one man has crammed into his life. 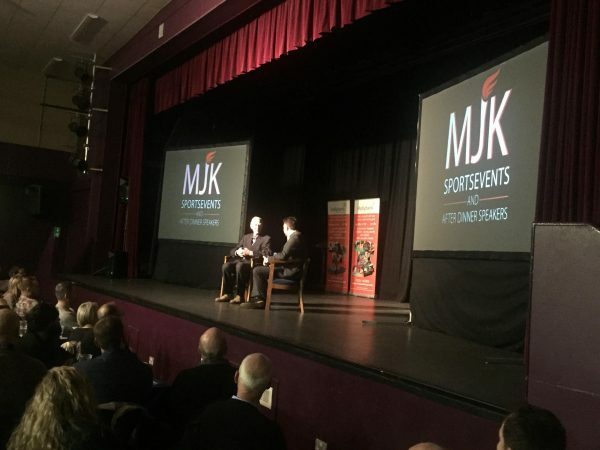 On September 27th 2019 once again at the BINGLEY ARTS CENTRE Celebrity Life Stories in association with MJK Sports Events once again have the privilege of hosting an event with Sir Ran as the special guest and as always to say we are thrilled is an understatement. Following a host of sell out shows at the Ramside Hall Hotel ( twice ), in Durham, the Grand Connaught Rooms, in London then more intimate night’s at Bingley arts centre and the Victoria Hall Keighley the audiences were captivated by the stories and left open-mouthed at the challenges faced and conquered by Sir Ran, his first wife Ginny and countless colleagues like Dr Mike Stroud, who have faced every challenge with him. 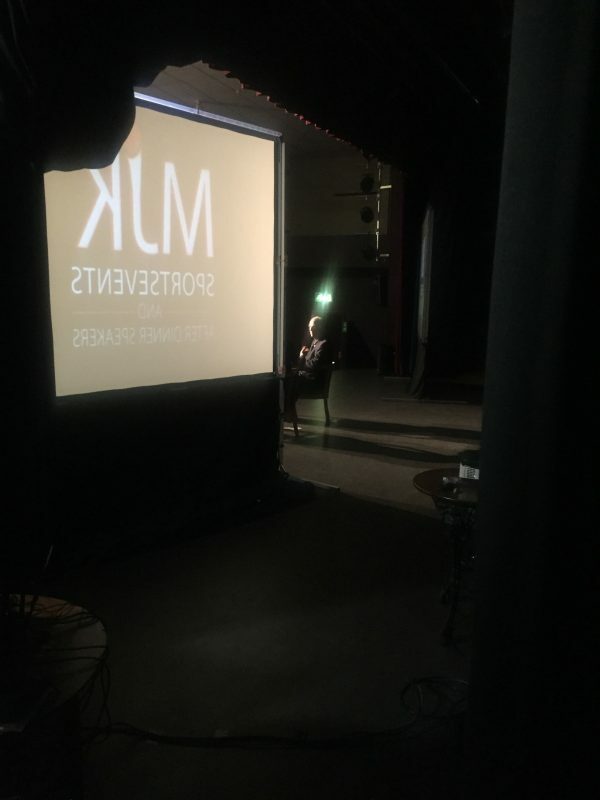 Three things stand out firstly from the big screen video entrance the 50 minute description of his life and the audience question and answer sessions that follow. He is not one to boast, he does not suffer fools gladly and he has a very dry but funny sense of humour. It is not for the faint hearted either, with a couple of pictures of hands and feet that had been subjected to extreme cold and the ravaged faces exposed to pure Ozone. Among the many physical problems Sir Ran describes, including heart-attacks and diabetes, one is very evident. Frostbite cost the explorer the fingers on his left hand and such was the pain during his wait to have them operated on in the UK (you have to wait five months on medical grounds) his description of literally taking matters into his own hands with his wife Ginny was as a bleak and matter-of-fact as any story you’ll ever hear. It is a privilege to be in such an incredible man’s company. He is undoubtedly a Great Briton and the World’s Greatest Living Explorer. Sir Ranulph Fiennes is super human and a super human too. If his story were not true you would not believe it and if you have not seen him live then this event is an absolute must. When the night has finished Sir Ran will host a book signing where guests can purchase any of his books and have them personally signed and dedicated by the man himself. Guests who purchase more than one ticket are guaranteed to be sat together.